Here are all my nail polishes from Caronia. First let me tell you what I like about Caronia nail polishes. Availability - They're widely available! You can get them from almost all drugstores and supermarkets. Price - Being a local brand and all, Caronia polishes are super affordable and super less expensive compared to foreign polish brands. I mean, I almost never use the same shade twice so I don't find the need for me to spend a lot of money for something that I'm only gonna use once. Shade range - The shades are really nice, from frosted to regular polishes. But, of course, I do have some problems with Caronia polishes, too. Staining - I find that Caronia nail polishes and those from other local brands like Bobbie and Cherry stain my nails big time. If you wanna avoid staining but still wanna use nail polishes, I suggest you get a really good base coat. I'm currently using the The Face Shop base coat. Inconsistency in formula - Some shades are really easy to apply but some shades are just a pain to put on because of the formula. This is the reason why I like their frosted polishes better than the regular ones. The frosted polishes, for me, are generally easier to apply and not streaky compared to the regular ones. Let's start with my blue and green shades. I forgot to take a pic of Peach Blossom. Anyway, the last items are from the Sweet Bliss collection, which is Caronia's summer 2011 collection. If I were to choose my top five shades from the ones I own, I'd pick the following. Dare - It's my first fave from Caronia. Bliss - It's PERFECT for gradient nails! Golden Sun - I'm loving gold shades right now. Sunset - It's my fave glitter top coat. Gorgeous colors <3 Love ur collection!!!! This is the reason why I love your blog Ayababes! You feature local brands that are available around the metro. I love this post too! Wooooot! Grabe girl tinalo moko mas madami ung sayo! Haha! Right. But I also feel like I still don't have A LOT. wow ang dami!!! great collection sis!! love the gradient sis!! I used the Carnia Dare and my colleagues found it so eye catching. You're so cute in the video pala! ohmygosh, LOOK AT ALL OF THESE POLISHES. hi! i live in singapore! so no caronia nail polish down here! btw, im half philippino, half chinese. 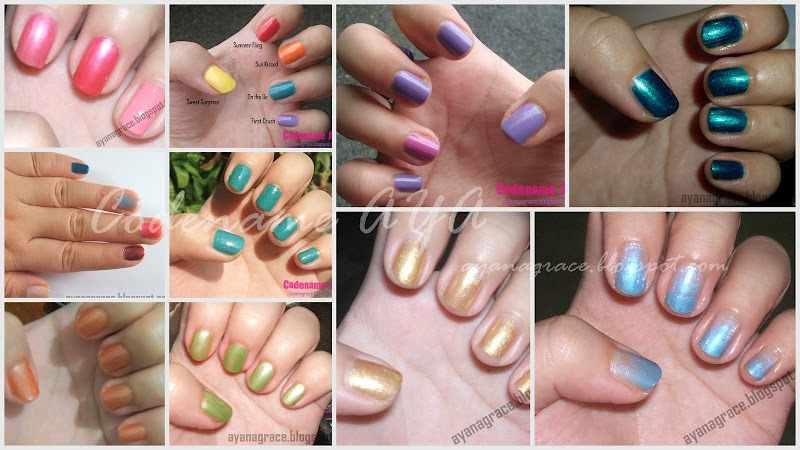 seeing this blog post, i will definitely look out for caronia nail polishes in philippines when i go there on december! any places in quezon city(dont know how to spell) where i can get them? :) thanks. Hahaha! I wonder when I'm gonna get tired of nail polishes :/ Will that day ever come? im really amazed im not alone in adoring nail polish haha :) ur collection are so cute..im also a fan of nail polish actually i already have 35 pieces of different colors of it...and still im not satisfied..hehe !! but im not bothered im using it in my costumers cos im a manicurist...so keep it up..hope ur collection gets more and more thanks :))) !!! !